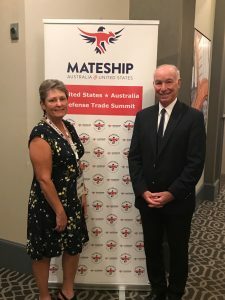 I was fortunate to attend the U.S.-Australia Defense Trade Summit in Mystic, Connecticut earlier this week. It was a wonderful opportunity to network with partners in the defense industry and to learn about what future opportunities Australia and the U.S. are exploring. Congressman Joe Courtney kicked off the event with an inspiring message about partnership and collaboration. This event was the first of its kind and I am proud that it took place in Connecticut. I have been in this industry for over 30 years and it is precisely this type of association that provides opportunity for women owned businesses like Atlas to showcase our skills. I was able to share my excitement about new innovations at Atlas like our new ink marking machine, and new technologies that are enabling us to produce our stampings in a more efficient manner. And of course, I always enjoy making that personal connection with our customers.